The Northern championships for senior Men (Teams of 6) senior women (teams of 4) and all young athlete ages (U13, U15 & U17 - teams of 3) took place on Saturday the 16th on a traffic free course around the Etihad stadium campus. 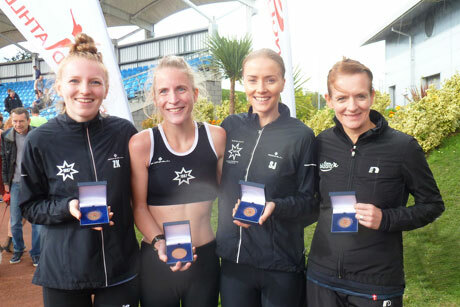 Rotherham Harriers strength across all age groups was impressive - the club had 14 scoring teams and was the only Yorkshire club with finishing teams in every age category race. Not only was the coverage the best we have managed for many years, but the level of club team and individual performances was tremendous. This is a tribute to i) the excellent work done by club coaches and team managers - Nigel Brookes, Richard Harris & Pete Shaw, ii) The dedication and commitment of the athletes & iii) the help & support of athletes parents & families. We had two bronze medal winning teams - the U15 boys team and the senior women's A team; The U17 women's team were 4th, the B team were 9th (and 2nd B team) and the C team finished 15th, making these the 1st three teams from South Yorkshire clubs. The senior men's A team qualified for the National championships for the 11th successive year by finishing 16th. (The first 25 clubs qualify). The senior women's B team were 7th (1st B team, and 3rd Yorkshire team).The U13 boys team were 9th, after some very consistent times by the 3 team athletes, and the U13 girls were 11th - a really good result for that trio. At an Individual level there were some excellent performances - Elliot Morton ran the 3rd fastest time of the day in the U15 boy's group.Mya Taylor ran the 3rd fastest time in the U17 women's race, with team mate Cyane Robinson recording the 10th fastest time. In the senior ladies teams, Jenny Blizard had a brilliant run to record the clubs fastest leg which made her the 4th= fastest of the day. Club mate Sophie Cowper was just 2 seconds slower than Jenny, and recorded the 6th fastest time. Ciara Mullane (40) 15:33, Elina Hine,(38) 16:51. Jack Steele (42) 12:29, Jay Jessop (32) 12:09, Samuel Gilson (31) 12:21. 4 Chris Griffiths (66) 24:41, 5 Carl Taylor (64) 24:55, 6 Philip Hoole (53) 22:30.